Tic Tac Trance #029 Replay available! 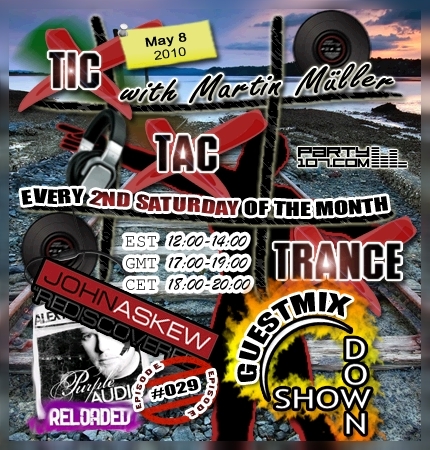 Tic Tac Trance #029 on May 8 2010, broadcasted, as always on Party107.com will feature an 1 hour record of a live set done by Showdown! Phil Appleby & Kieran ‘Kiz’ Everard formed Showdown to be able to keep driving & uplifting trance style alive, that means you can expect a trancy guestmix from the two guys in the second half of my show! My own job for the first hour is to bring you into the right mood. This time I’ve chosen selected tunes from the albums John Askew – Rediscovered and Alex M.O.R.P.H. – Purple Audio Reloaded. But that’s not all, there will be also tunes from artists like Mat Zo, Ferry Corsten and many more!